Book of Ra is one of the top slot machine games manufactured by casino gaming provider Novomatic. Every online slot game player in the world wishes to see 5 Books of Ra or 5 Indiana Jones scatters. Respecting the tradition of games with 9 lines and bonus feature, Novomatic hit the market with this Book of Ra slot machine game. Even after so many years of the occurrence, classic Book of Ra is gaining thousands of fans annually. 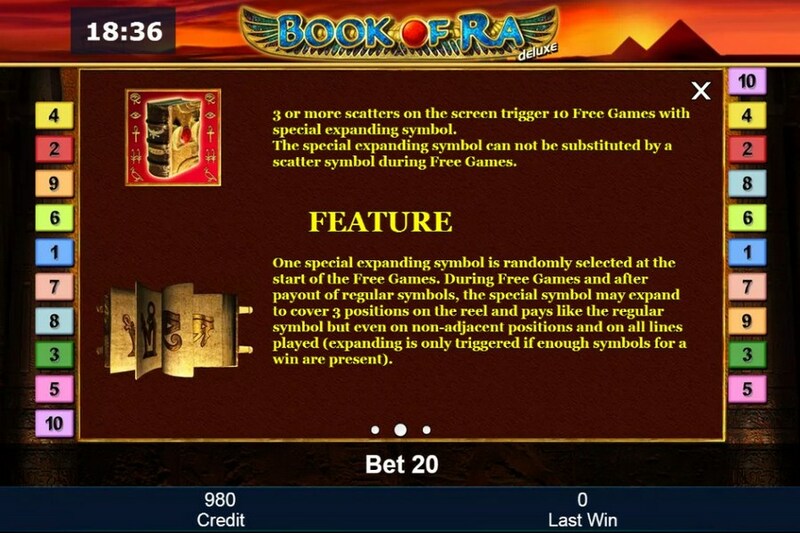 Win 10 free spin games when you see three or more Book of Ra slots symbols in any position. The settings from your previous standard game will be taken over into the free games. A bonus symbols of slot is randomly selected at the beginning of the games and can expand after every payout to include all the reel positions during a free game. They count along active pay lines even if they symbols don’t lie next to each other, but the minimum number of bonus symbols must be achieved. 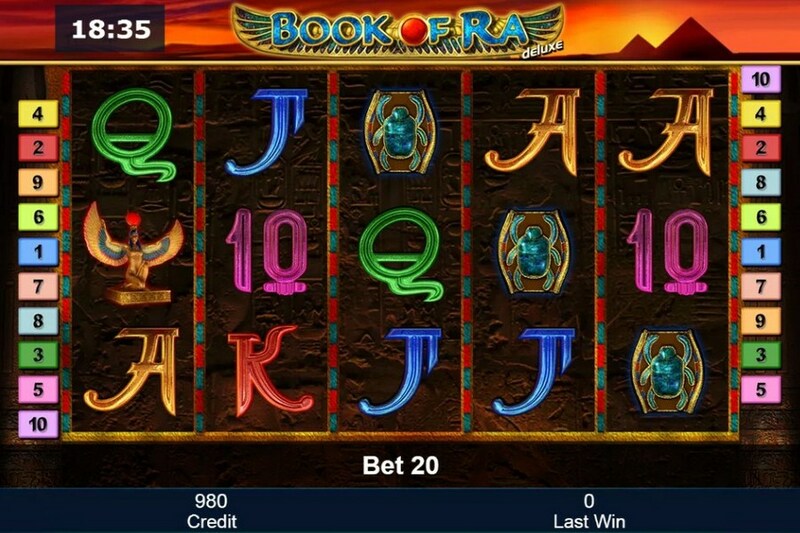 Book of Ra "Classic" online slot game consists of 5 reels with 9 paylines, while the Deluxe version includes 5 reels and 10 lines and is visually improved a bit. The aim is to connect a minimum of 3 to a maximum of 5 equal symbols from left to right. The symbol 'Book' serves as a joker symbol of slot and the bonus symbol. Gaining at least 3 bonus symbols starts the bonus game (to gain a bonus, the books don't have to be located in one of the paylines, cause they are scatter symbols). 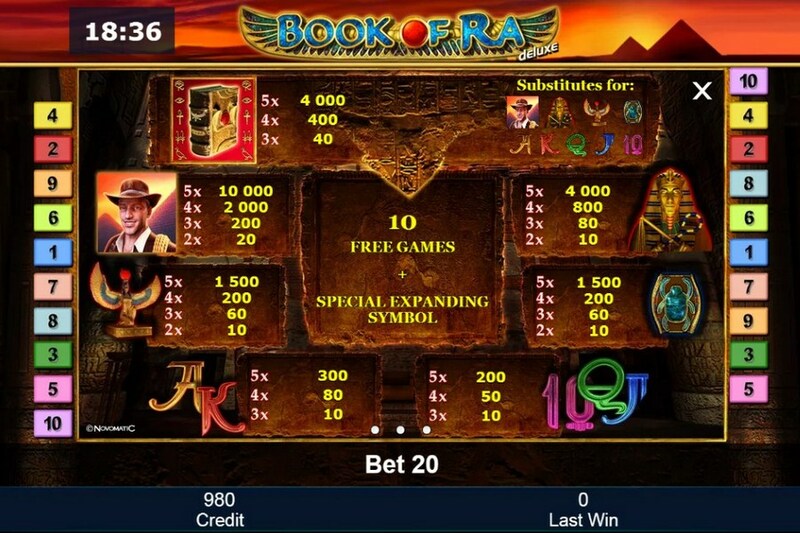 Book of Ra is one of the most popular slot games online and entertaining casino games. The specificity of this casino game for real money is that it introduces you to the mysterious world of ancient Egypt and puts you into the role of an explorer searching for a mythological book that brings wealth to the owner. Brilliant graphics and slots symbols along with oriental sound effects, create fully authentic vibe and raise tensions during playing the game.